People who live on the Texas Gulf Coast share a common concern with Hill Country residents: How do you escape a disaster? 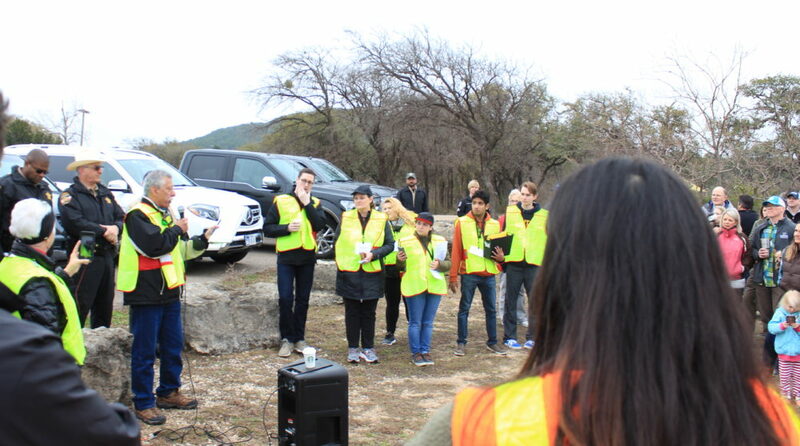 Comanche Trail Community Association President Pedro Martinez debriefs with organizers and participants when Saturday’s mock wildfire evacuation was finished. Last month, the Lubbock Avalanche Journal reported that though wildfire season typically begins in March, West Texas is seeing wildfires even earlier in the year. As a result, lots of communities have a plan of action for wildfires. But how many Texas communities perform a dry run before an emergency actually happens? So far, only one, the Comanche Trail neighborhood near Lake Travis, has done such a drill. “I’m on the top of a hill, so I worry about a fire starting at the bottom,” said Tom Hollingshead, who was getting ready for Comanche Trail’s drill last Saturday. It was a cold, wet day but Hollingshead and others had fire on their minds. Comanche Trail is tucked in a hillside along scenic Lake Travis in the Texas Hill Country. It’s surrounded by vegetation like cedar trees, which become flammable during dry spells. The neighborhood is also close to a couple of popular lakeside parks where the risk for recreational fires going wrong is high. But residents are concerned about something else: how to evacuate if a wildfire starts. “We only have one way in and out if you want to get to the main streets. So, we’ve all kind of wondered forever, ‘What if?’” said resident Gary Maddox. Will Boettner is a fire education outreach coordinator for the Travis County Fire Marshal’s Office. Boettner said this drill is the first of its kind in Texas. “One of the things that is remarkable given how many wildfires we’ve had in the country in the past 10 years: There are very few communities that have actually done any evacuation planning or have done any evacuation drill,” Boettner said. The practice evacuation includes a couple of steps. First, participating residents are encouraged to prepare “go-bags” – they’re told to think about what they absolutely need to bring with them in the case of an emergency. “Last night, we talked about getting ready – what would we need? Our medications? Our pets? You have that conversation at home about getting ready,” said resident Debbie McCasland. Second, the drill kicks off with a text alert sent out to residents from the Comanche Trail Community Association. Boettner got the text a little after 9 a.m. The community association’s president, Pedro Martinez sends out another text fifteen minutes later. “This is only a drill. 9:15. Wildfire now threatening our community. Spreading towards homes. Evacuate to Oasis parking lot now. This is only a drill,” Martinez said, as he reads the text. Cars begin to trickle out of the Comanche Trail neighborhood onto the only road that leads out. Law enforcement officers line the road, directing drivers out of the community. They are told to go to the parking lot of a popular lakeside restaurant called The Oasis, which is a couple of miles up the road. After twenty or so cars go through, those running the drill add a challenge. The rest of the drivers are told to turn around and go the opposite direction, to a lakeside park where the road dead-ends. They’re told to shelter in place there. “It’s organized, actually – really organized. A year and a half of planning has really proved well,” said Randy Jameson who lives in a nearby community called River Place. Jameson is tagging along with first responders to see how the drill unfolds. He wants to plan an evacuation drill for his community, and another community close to him: Steiner Ranch. In the summer of 2011, during one of the state’s worst wildfire seasons, a wildfire destroyed more than twenty homes in that neighborhood. “We in River Place stood and watched the smoke and the flames coming towards us from Steiner Ranch,” Jameson said. Like Comanche Trail, Steiner Ranch has only one way in and one way out. That resulted in a long and chaotic evacuation during the 2011 wildfire. Jameson said eight years later, he’s concerned these communities still aren’t prepared. “It’s now 2019, and trying to get interest, to get residents to be interested and to protect themselves in the event of wildfire, that’s one of our biggest challenges,” Jameson said. Saturday’s drill was, of course, only practice. During an actual wildfire, Will Boettner said things wouldn’t be as calm as they were during the drill. “In a real-world situation, you would be dealing with a big adrenaline rush on everybody that was involved, both from the neighborhood group and the first responders,” Boettner said. But at the end of this practice evacuation, the mood is light and celebratory. For community leaders like Pedro Martinez, Saturday’s drill was a long time in the making. Resident Gary Maddox said the drill gave him some idea of what it would feel like to be in a wildfire. “It’s great because none of us would know exactly which way to go,” Maddox said. Another resident, Donna Ackman, also said the drill was helpful. “I think my husband said if anybody’s ready for a wildfire, we’re as close [to] ready as we can be, which is a horrible thing. But you know, we all feel like we’re a little better prepared,” Ackman said. They’re grateful for the practice. And so are observers like Randy Jameson. He said he’s planning wildfire evacuation drills for his community and for Steiner Ranch. “We won’t think or try. We will; it will be done,” Jameson said. Organizers of the drill said they’re gathering data from Saturday’s mock evacuation to share with leaders of other neighborhoods. Ultimately, they hope to provide a how-to guide for communities across the state, and the country, that want to organize their own wildfire evacuation drills.